“How long must one wait for eternity to begin?” This is the nagging question monopolizing the thoughts of the weary souls who are forced to move at glacial speed down the course of a poorly lit passageway. They are unable to retire the question and turn their thoughts elsewhere to more pleasant musings. How unfortunate it is that so many are prone to playing the role of mental masochist, a self-destructive vice carried over from life into death. The tunnel walls are lined with black granite, whose fine texture is interrupted at fixed intervals by magenta-colored gargoyles on either side of the walkway. The crafted sculptures emit a curious, soft glow from their jack-o’-lantern cores, splashing a dull reddish-orange shade over the effulgent stonework canvas. 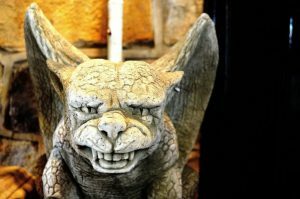 Their cuddly little faces and sheepish grins make them appear like adorable domesticated pets rather than fearsome fiends poised to attack—notwithstanding the chiseled ram horns and the formidable bat-like wings extending proudly from their muscular, broad shoulders. The tunnel is so inundated with bends that its total length is masked, stomping upon the hopes of its weary travelers, who yearn to see the end. They wonder if they walk in circles, since each stretch of tunnel between the bends looks identical to the one before and after it—with even the gargoyle facades not varying in the slightest detail. The unchanging appearance of the tube is complemented by an unrelenting smell, as a pungent stench of sulfur uniformly permeates the dank, musty air with a near suffocating effect on the travelers. The sound of a distant metronome governs the steps of each soul, communicating “right foot forward” or “left foot forward” with each metrical tick. Occasionally, the metronome stops and causes the line to come to an abrupt halt, and then resumes shortly afterwards at the same pace. A few impatient travelers erupt out of indignation, heaping curses and insults upon the one responsible for orchestrating such an instrument of control and humiliation. Conversations are common but difficult to carry on, since it is forbidden to leave one’s place in line or to turn around and face the person to the rear. A stealthy, hooded sentry occasionally leaps out from the shadows between two gargoyles to strike an unsuspecting soul with his truncheon. The phrase “Keep in line, you swine!” is issued frequently by these zealous guards stationed along the course. Of the multitude of dialogues occurring along the march, the reader’s attention shall be directed to one in particular. “Now, nothing matters—even our warmest hopes cannot anesthetize us from this cruel predicament. For the first time, we’ll assume an existence devoid of everything we cherished in our former lives. What will it be like to receive no more guidance or love from family or friends?” asks a short, pudgy man with a high-pitched voice. “Do they?! That is exactly what people said about The Great Mortality before it reached England. It then wiped out half of my village in 1349, including the very people who doubted its lethal nature. I thought that experience was all the hell a man should ever have to encounter.” The taller man nearly turns around to face the other, but then notices a sentry staring at him. “My, I didn’t realize you were so old!” stammers the short man. “So we should believe the worst rumors now and capitulate to our fears? Our fears are no longer irrational, but objective realities? “That’s why it’s called ‘hell’, sir.” The taller man chuckles.